Your dog likes to wag his tail, not his toothbrush, right? But just like in humans, plaque and bacteria develop in your dog's mouth. If it's not brushed or scraped away, plaque can turn to tartar within 36 hours. Tartar buildup can lead to painful, inflamed gums, and open the door to infection and periodontal disease. Dog food and treats frequently boast their beneficial dental qualities. Tossing your pup a dental-cleansing treat is certainly easier than convincing him to let you brush his teeth! But when it comes to dental benefits, not all claims are created equal. Dry kibble has been credited with keeping teeth clean, and the crunch of dry kibble can keep teeth cleaner than a diet of wet food, which is stickier and more likely to get trapped in between teeth. But while daily kibble helps, it can't do the entire job by itself. Long-lasting chew items can offer the most cleansing benefit -- things like rubber or nylon chew toys, or rawhide or a knucklebone. 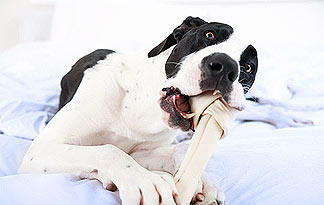 Your dog should spend about 30 minutes gnawing, daily, for maximum tooth-scraping benefit. Supervise your pup with any prolonged treat, and take it away if it becomes small enough to pose a choking hazard. Whatever you choose, shop wisely. A treat with the Veterinary Oral Health Council's seal of approval means it has been studied and proved to have some dental benefits. Also, consider the size of the treat you're buying. If Fido gulps it up in seconds flat, it probably didn't have much chance to do widespread work. Although your dog won't mind eating numerous treats to maximize his cleaning potential, you don't want to trade clean teeth for a pudgy pup. It would be great if treats and chews were the doggy dental care solution, but some pooches can chew and chew and still have dental problems. We'll tell you why next. You've stocked up on some good quality chews and your dog is drooling, anxious to get to work. Don't dismiss your dental worries just yet. Smaller dogs, or breeds with a crowded or stacked bite, are more likely to have "hiding spots" in the mouth. This means that no matter how long or hard he chews, some areas in his mouth just can't be reached, so plaque will develop. And while chewing will help with the surface of the teeth, it doesn't get under the gum lines like the bristles of a toothbrush, says Dr. Santiago Peralta, DVM, specializing in dentistry and oral surgery at Cornell University. Also, as with any health consideration, other factors play a role in your dog's susceptibility. Oral conditions such as periodontal disease are influenced by your dog's age, background, breed and his immune system's reaction to bacteria. So even the most avid chewer may develop problems. So do dental chews and treats really work? Some do have dental cleaning benefits, particularly those that are VOHC-approved, says Peralta, but there's no substitute for the benefits of toothbrushing and professional care. To keep your dog's pearly whites in the best condition, offer dental cleansing treats and chews as a supplement, but don't forgo other elements of dental care.